Like many people I am the type of person that needs to prove to myself that something actually works before I will buy it or endorse it. Such was the case for Battery Equaliser. I had to see it work. I am very pleased to say that I am now a believer! I had two large pieces of equipment that ran off batteries to test the battery equaliser product on. One was an electric forklift and the other was an electric boom. The batteries in the boom were considered dead and we were going to replace them. The boom had been sitting idle for one year outside. 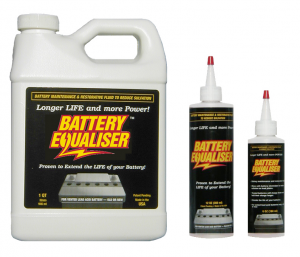 We decided to try the battery equaliser. To our surprise the batteries began to take a charge and after three charges the batteries passed a full load test as if we had put new batteries in. 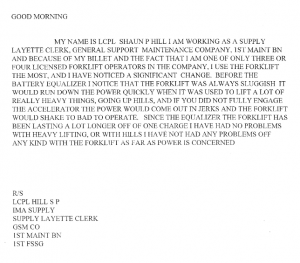 The second piece of gear was an electric high mast forklift that we bought for our warehouse. We fully anticipated having to replace the large batteries when we bought the machine. Once again we tried the battery equaliser in these batteries and I am pleased to inform you that I am very impressed with its performance. The forklift takes a full charge and I have saved the cost of replacing these large batteries. I have no hesitation recommending this product to anyone. It does what it claims it will do! Branch Manager, The CAT Rental Stores.